Domain privacy is optional. 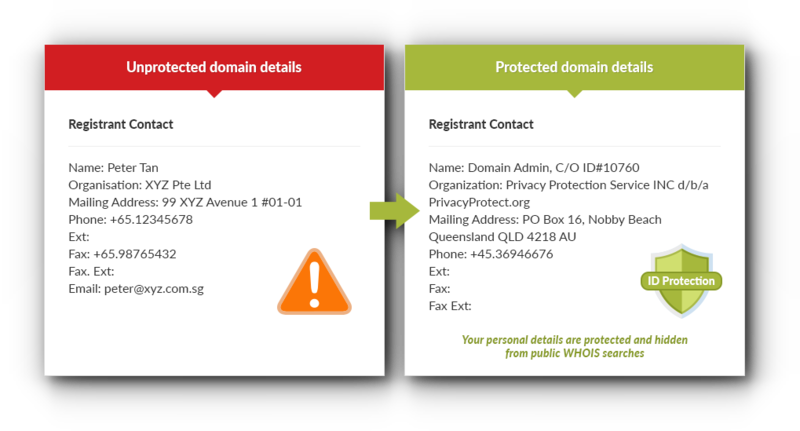 You can protect your personal information from being obtained from the public domain whois system using Vodien’s ID Protect. With ID Protect, your registrant contact details will not be visible in public domain whois searches, helping you keep unwanted attention and email spammers away. Please do note that ID protection is not prorated and the expiry date for it will be in-line to Domain Name’s renewal and expiration dates. Due to registry restrictions, ID Protection cannot be used with .com.sg, .org.sg, .sg, .bz, .ca, .cn, .uk, .co.uk, .de, .eu, .in, .me.uk, .nu, .li, .ch, .fr, .org.uk, .us, .es, .com.es, .nom.es, .org.es, .com.au, .net.au, .nyc or .org.au domains.